The See became vacant and Msgr. S. Lazar, SDB, as Vicar Capitular, administered the Diocese ably for 21 months. In an effort to bring the diocesan boundaries in line with the civil district the Taluk of Tiruthani in the District of Chingleput belonging to the Diocese of Vellore was detached from it and added to the Archdiocese of Madras – Mylapore, and the Taluks of Thiruvannamalai and Chengam in the District of North Arcot till then still belonging to the Archdiocese of Pondicherry-Cuddalore were detached from it and added to the Diocese of Vellore. (Decree Prot. No.404/69 1st September 1969 of the Sacred Congregation for the Evangelization of Peoples). On March 06, 1971, The Most Rev. Rayappan Antony Muthu was nominated as the Bishop of Vellore. He was consecrated Bishop on April 21, 1971. In his efforts to help the priests, his co-workers in the parishes, and for the good of souls, he contacted many congregations of sisters and established not less than 24 convents in the Diocese of Vellore. To crown them all he succeeded in getting established Perpetual Adoration Monastery of Sisters of Poor Clare at Rangapuram, Sathuvachary where prayers are offered 24 hours a day for Diocese. He also erected 17 new parishes. He also saw to the needs of the retired priests in getting a house constructed at Sathuvachary, Vellore. To provide for the needs of the people who are sick, he built about 21 dispensaries. He also developed the economic condition of the people by providing them with sewing machines, bulls, cows, goats and sheeps. Mother and Child welfare programme was well organized with the help of CRS. It is during his time, by a Decree Prot. No.218/75 dated 20th January 1975, of the Sacred Congregation for the Evangelization of Peoples, that the five taluks of the civil district of Chittoor, namely Chittoor, Palmaner, Kuppam, Bangaupalam and Satyavedu belonging to the Diocese of Vellore were detached from it and added to the Diocese of Nellore, Andra Pradesh. From now on the old civil territory of North Arcot district which is now Vellore District and Tiruvannamalai District comprise the Diocese of Vellore. 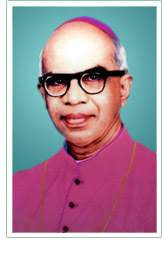 After his untiring work of ten years, Bishop Antony Muthu of sacred memory was called to eternal reward on December 19, 1980. The next day the Diocesan Council met and elected Very Rev. Msgr. S.T. Ignatius, the then Vicar General of the Diocese to the Vicar Capitular. The Diocese was ably administered by him for seven months.